HÀ NỘI – Chairman of the Hà Nội People’s Committee Nguyễn Đức Chung held a dialogue with local residents in Đồng Tâm Commune in the city’s Mỹ Đức District on Saturday. After the meeting, the local residents agreed to release all officials and policemen they had illegally detained. At the dialogue, local residents emphasised eight major petitions out of the total 21 petitions they raised to the city authorities. They however admitted their wrongful acts and law violations which they said were due to a lack of knowledge. They expressed their hope that relevant agencies and the chairman of the municipal People’s Committee will excuse them for their wrongful acts and would not impose a criminal charge on them. The residents asked the People’s Committee of Mỹ Đức District to stop disseminating information through loudspeakers that the Sênh field belongs to the military before clearing up the relating matters. They also suggested the Viettel Telecom Group stop construction before the final conclusion is announced, and the municipal Chairman to directly instruct and handle the case. They also affirmed and asked local authorities to acknowledge that all policemen and officials held at the commune had been well treated and protected. On behalf of residents in Đồng Tâm Commune, Bùi Văn Kỷ admitted that it was wrong to capture policemen and officials and expressed his hope that locals will be excused for their acts. Meanwhile, Nguyễn Thị Đề, 50, affirmed that local people had always followed the Party and State’s policies and hoped that the case would be solved completely with due consideration. For his part, Chung said the city had issued a decision on April 20 to comprehensively inspect the management and use of the land for building Miếu Môn Airport in Đồng Tâm Commune. He pledged that he would personally announce the results after 45 days of inspection to ensure that all local residents would be consented. The inspection would involve different bodies including central agencies and would be supervised by National Assembly deputies and government inspectors, Chung said, requesting local residents to cooperate in providing documents and co-supervise the inspection. The city has assigned local police to investigate the arrest of Lê Đình Kình, a resident of Đồng Tâm commune and strictly handle violations if there were any, Chung affirmed. 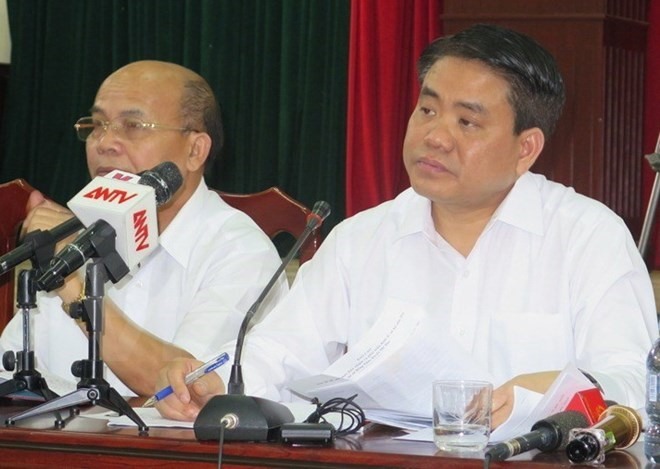 The Hà Nội People’s Procuracy on April 21 annulled a decision on the arrest of Lê Đình Kình, one of four local people captured on April 15.